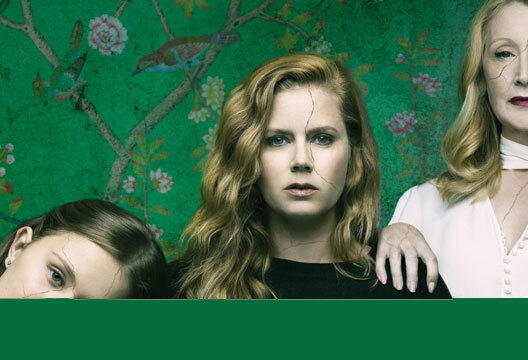 Sharp Objects (TV), reviewed by Kate Johnstone (Associate Editor for Culture). Four years ago, HBO gave us the TV series True Detective, a masterpiece of Southern Gothic storytelling, updated for the 21st century. Now we have Sharp Objects, an equal in its psychological gothic-ness, but strengthened by a feminist perspective. Based on Gillian Flynn’s first novel (her subsequent Gone Girl was a huge book and film hit), Amy Adams plays Camille, a journalist in St Louis. Camille is asked by her editor to return to her home town of Wind Gap, Missouri. One girl has been brutally murdered and a second, Natalie, is now missing. Camille’s remit is not to report on the crime per se; rather, as someone who knows the town intimately, to write about the impact on the locals. But as we learn in the first episode, Camille is struggling with alcoholism and self-harm – as implied in the show’s title. She is not happy to be returning. Camille’s mother Adora (Patricia Clarkson) is a southern belle who coats her manipulative and calculating behaviour in old-fashioned manners and femininity. Camille’s half-sister Amma (Eliza Scanlen) is treated like a child by Adora, although she’s a teenager who hides her rebellious side. Camille and Adora had another sister, Marian, who died. Shortly after Camille arrives in Wind Gap, Natalie’s body is discovered, propped up on a window ledge, minus her teeth. The hunt is on for Natalie’s murderer, and Camille needs to start producing some copy. Unlike True Detective, this is not focused on the police hunt – although Camille cultivates the out-of-town detective Richard Willis (Chris Messina), brought in to beef up the local police department. The requirements of following the crime lead her back to places and people she has long since attempted to forget. Flashbacks are often overused or lazy, but here they are deployed with intelligence, organically revealing Camille’s troubled psyche. It is fascinating to see a drama address the extent to which we can be both the author of, and slave to, our memories. We see the world through Camille’s eyes, and she is in every scene. As her stay in Wind Gap extends, and tensions increase, so does her ability to stay mentally in control. We see stray words appearing, such as the car radio briefly displaying ‘wrong’ before returning to ‘aux’; and we are drawn to fleeting incidental details – a safety poster that says ‘Don’t be a victim’. Music is also used to great effect, never playing behind a scene but only in them. There are many powerful scenes, both large-scale – the creepy Calhoun Day celebrations – and small – Camille and Adora out-staring each other across the table. The performances are stand-out. Often in crime drama the mental health of characters is either an aspect of their personality, or the whole purpose of it. Here, Camille’s mental health is so tightly woven into the narrative that the stories are inseparable. We want to ‘solve’ the mystery of what made Camille this way, as well as solving the crime. Although undeniably gothic in its telling, Sharp Objects is a compelling portrait of dysfunction in a woman, a family, a community: a warped morality tale with a sting.